The Tiguan GTE Active Concept displays the next phase of VW's design language. DETROIT -- Volkswagen showcased the versatility of its MQB platform with an off-road ready plug-in hybrid variant of the redesigned Tiguan compact crossover. 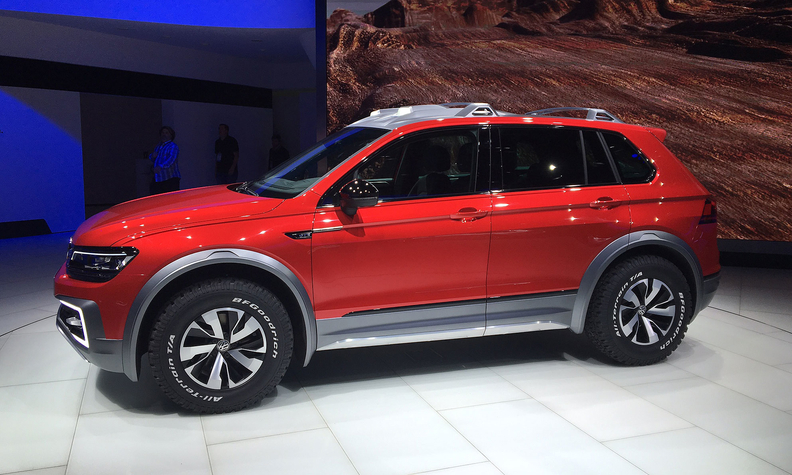 The Tiguan GTE Active Concept is a rugged imagining of the Tiguan GTE plug-in hybrid shown at the Frankfurt auto show in September. It sports bigger wheels and off-road tires, additional ground clearance, tougher body panels and VW’s 4Motion all-wheel-drive system. The concept was shown to journalists on Sunday ahead of its debut at the Detroit auto show on Monday. The car showcases the design of the long-wheelbase Tiguan that will go on sale in the U.S. in 2017. It is based on the five-passenger Tiguan that recently went on sale in Europe. Klaus Bischoff, VW brand head of design, said the concept’s headlights, grille, hood, front fenders and rear taillights will all appear on the U.S. Tiguan. Bischoff said the extra length was added behind the B-pillar for more rear-seat legroom and to the rear overhang to better accommodate the optional third-row of seats planned for the U.S. Tiguan. The Tiguan concept also displays the next phase of VW’s design language, one intended to make a stronger impact than its understated designs of late. The plug-in hybrid system combines electric motors at the front and rear with a 148-hp turbocharged, direct-injection gasoline engine -- all mated to a six-speed dual-clutch transmission. The concept can be driven by the front, rear or all four wheels, depending on the driving mode and road conditions. The system defaults in electric-mode with power from the 114-hp rear electric motor. The 54-hp front motor can be switched on automatically if the rear wheels slip or manually by the driver. Klaus Bischoff, VW brand design chief, shows the Tiguan GTE Active Concept on Sunday afternoon ahead of its Detroit auto show debut on Monday. Up to 20 miles of pure-electric range is available, while the total range with a full tank of gasoline is 580 miles, VW says. While a concept, VW says the Tiguan GTE Active crossover’s combination of off-road capability with 20 miles of zero-emissions driving highlights the versatility of its MQB, or Modular Transverse Matrix, platform used to underpin several of the group’s small to midsize vehicles. The concept also highlights VW’s planned crossover blitz to revive its sales momentum in the United States, as the German automaker grapples with the sales and marketing fallout of from its ongoing diesel emissions cheating scandal in the U.S. and Europe. A long-wheelbase version of the next-generation Tiguan arrives in the U.S. next year after the brand’s new midsize crossover goes on sale in early 2017. It also highlights the VW Group’s plans to launch 20 new plug-in hybrid or battery-electric vehicles globally by 2020. The Tiguan was a sales hit in the U.S. in 2015, with sales surging 43 percent to 35,843 vehicles.